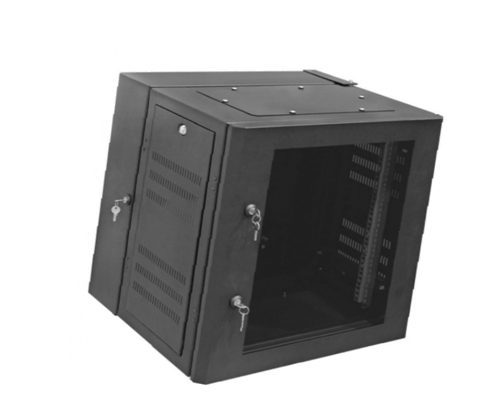 Double-section network cabinet for assembling 19″ equipment. Designed for indoor applications. * 75% of load placed in Wall-mounted Section. Static load, superficial weight. Warning: Do not install equipment until you have stabilized the enclosure. Install heavier equipment first and install it towards the bottom of the enclosure. Install equipment starting from the bottom of the enclosure and proceeding toward the top of the enclosure – do not reverse. The top of the cabinet has rectangular opening for cable access and management. This opening can be opened or closed by unscrewing or screwing in the removable solid blanking plate. Additionally cabinet has one or two (depends on cabinet’s height) cable openings in the Wall-mounted Section (on the back). The cabinet should be stored in a controlled indoor environment, away from moisture, temperature extremes, flammable liquids and gasses, conductive contaminants, dust and direct sunlight. Store the cabinet in its original shipping container if possible. Seller guarantees this product, if used in accordance with all applicable instructions, to be free from original defects in material and workmanship for a period of 5 years from the date of initial purchase. – Damage resulting from accident, misuse, abuse or neglect. – Inappropriate transport to the final installation location. – Inappropriate installation, repair, modification to any mechanical components. – Exceeding maximum load capacity as indicated under product specification page #4. – Being used for outdoor use and dust filled environments. All cabinet’s elements are grounded.Grounding bar not supplied,need to order separately. – 19″ Section with safety glass mounted in frame with possibility of changing the door opening direction. 100 x 250 mm (3.94 x 9.84 inch) and openings for assembling. Cabinet is equipped with two easily adjustable mounting profiles spaced at 19″. covered with solid blanking plate, bottom plate is solid. Wall-mounted Section has one or two (depends on cabinet’s height) cable openings on the back. Removable, perforated side panels. Cabinet can be equipped with additional adjustable mounting profiles or angles. Wide range of supplementary accessories: shelves, drawers, fan kit etc.